↑ "One World Trade Center to retake title of NYC's tallest building". Associated Press. Fox News Channel. 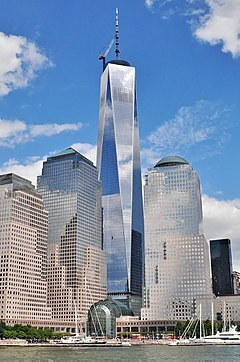 April 29, 2012. http://www.foxnews.com/us/2012/04/29/one-world-trade-center-to-retake-title-nyc-tallest-building/. अन्तिम पहुँच तिथि: May 1, 2014. ↑ "१ वर्ल्ड ट्रेड सेन्टर", SkyscraperPage। . Retrieved January 17, 2012. ↑ During the planning stages, the building initially dubbed Freedom Tower as the official name. Later the owners decided to call it One World Trade Center.